Fine 19th Cent Shepherd's Smock (or Frock Coat) in exceptional condition. These wonderful Folk Art items are now very rare to find in such good condtion. Made of linen this Smock is of a classic style having pockets either side and complete with old bone buttons. The front has a large smocked panel wth zigzag stitching. There are diamond stitced panels running down either side and this is echoed on the collars and cuffs. The gathered smocking allowed for stretch in this working garment. The back has a collar and similar panel to the front. Smocks had become deemed 'too old fashioned to wear in England after about 1880' so these early garments were discarded. 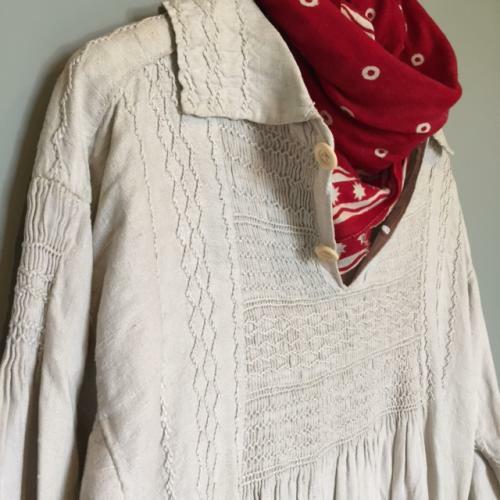 There was a sense of pride in wearing a hand made smock and the detailed stitching could vary in regional patterns to different parts of the country. Some special smoks were deemed Sunday Best and only worn on those days. I think it is for this reason that they were folded up and stored away after use and handed down through the families like a piece of needlework.